Danhostel Ribe in Denmark, which has held the Green Key certification for over 18 years, has seen a steady increase in guests who are interested in the eco label, what it means and representing what it stands for. Using sustainable waste facilities and recyclable boxes is just the beginning. 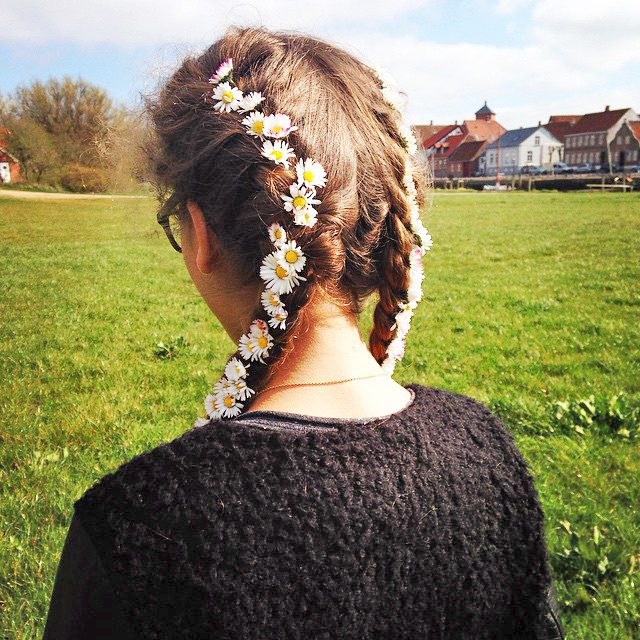 The petals of these pretty daisies in a guest’s hair are nice and pesticide free. Green Key is an international eco-tourism label represented in more than 45 countries. The Green Key certification basically makes it easy for travellers to stay somewhere which benefits the planet, and gives them a comfortable stay at the same time – all the quality and facilities you’d expect from a hostel but with the feel good factor: Green Key hostels include introducing environmental management, reducing energy and water consumption, waste separation, using environmentally friendly detergents and cleaning agents, promoting organic products, avoiding chemical weed control products, and much more important stuff which goes on behind the scenes. Phew. Those at Danhostel Ribe have noticed, through comments from guests, that eco status has a growing influence on travellers in deciding where to stay. People recognise the environmental efforts establishments make and are happy they can do their part in making tourism more sustainable. Another bonus? Danhostel Ribe is situated next to the national park Wadden Sea, meaning it’s the perfect place to enjoy the beautiful nature, effortlessly and responsibly. The Danish Wadden Sea National Park was awarded UNESCO world heritage status in June of last year, meaning it is considered to be outstanding in its universal value. A visit there will show you why – the largest unbroken series of tidal flats in the world is a breeding ground for migratory birds and a thronging pool of wildlife activity. Not only do Danhostel Ribe have Wadden Sea National Park as their next door neighbours, but they’re also National Park Partners, doing their bit to protect the area. Take a look at some of our eco hostels featuring in our HI Sustainability Fund.